Here you will be led on a guided tour of this incomparable park, which is unique in the world! It is listed as a World Heritage Site by UNESCO, and is one of the most prominent landmarks in Barcelona. During the approximately 2-hour tour you will go past the dragon, one of the most prominent landmarks of Barcelona, you will see the famous curving bank and the market hall with the crooked columns and of course the extensive park. Park Güell is certainly one of the most famous sites in Barcelona. Here you will be led on a guided tour of this incomparable park, which is the only one of its kind in the world! This unique architectural marvel, designed by Antoni Gaudí, is situated in the middle of a natural environment. The park was commissioned by Count Güell, who wanted Gaudí to design an elegant period property with detached houses. It is now a public park, and is part of the City of Barcelona’s heritage; another miracle that awaits your visit. Hardly any other park inspires its visitors as much as Gaudí's Park Güell, which was once planned as a residential complex. 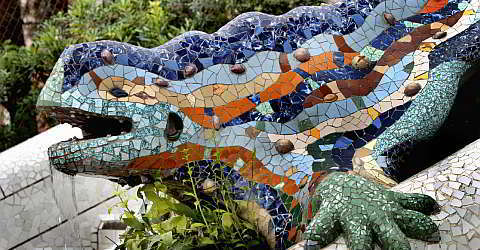 During the approximately 1:45 hour tour you will be led past the dragon, one of Barcelona’s most prominent landmarks, you will see the famous curving bench, the market hall with crooked columns and of course the extensive park. The tour is in English. Booking is simple: here on the right of this page enter the number of the people for whom you wish to book, select the date and click on "Add to cart". Advance reservation is required. You will receive a booking confirmation within 48 hours of booking. In case of cancellation up to 48 hours before the event you will be refunded the entire amount. In case of late cancellation or no-show, no refund for the booked event. If a course is canceled by the organizer, you will be refunded the full amount.